Are our Australia small group tours for you? Via Travel operate Boutique Australia small group tours: Locally owned & operated – Food, wine, beaches, walks, wildlife and amazing nature experiences daily. Sleep well in hand picked hotel accommodation. Local & authentic knowledge and experienced guides. Explore the East Coast of Australia in a small group, with a locally owned & operated company that loves nature, food, wine & the friendly faces that we work closely with. Includes nature based activities each day and the chance to relax with some “Me Time” too. Sleep well in hand picked 3 & 4 star accommodation.​ There is no age limit, but all guest must be young in spirit & active enough to participate daily in light to medium walks, some lasting up to 2 hours. Meet your guide & new travel mates in Brisbane city, at Royal On The Park Hotel, 10am. We’re headed to Australia East Coast must-see sun-kissed Noosa (via one of Australia’s top surf spots and home to some of our champion surfers). 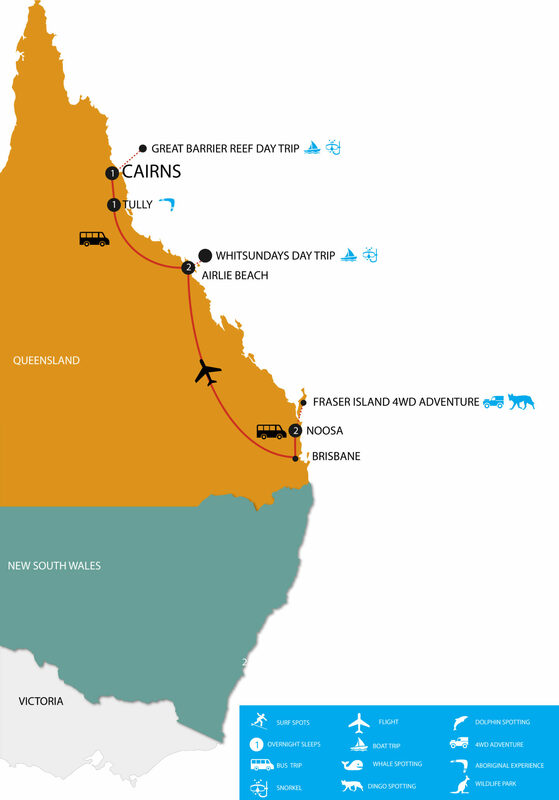 We’re crossing into Queensland – the Sunshine State – which means koala-spotting in a national park followed by a magnificent sunset overlooking the Sunshine Coast hinterland from a coastal lookout. Rest up in the evening, or hit the bustling town for dinner and nightlife. Extending your stay in Cairns? Ask us about extra activities & accommodations nights, we are here to help. Twin Share room with bathroom: AUD $3995 per person. Ideal option for a single traveller who wants to share a room (No forced single supplements – If we can’t match you with a same gender traveller, we will upgrade you for free). Adult Double Room with bathroom: AUD $3995 per person. Ideal for a couple or friends/family travelling together (Tell us if you want to share a bed together, or you want 2 single beds). Single Room with bathroom: AUD $4795 per person: Private rooms with own bathroom. Ideal for solo travellers enjoying the company of others by day & a private room at night. When it comes to having the best experience on the East Coast of Australia, Via Travel are the people to go with – super knowledgable and great fun to tour with!